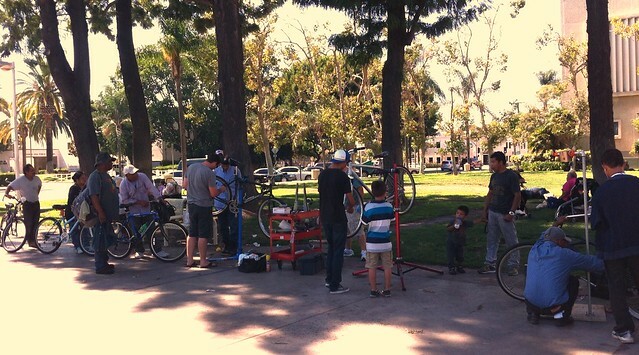 Ok folks we’re heading out again to Santa Ana to help fix bicycles for the homeless. Did you know we’ve been doing this for about 3 yeas now?! Ya I was pretty surprised myself. Anyhow, we’d love to get as many volunteers as we can. But we also need some hard goods donated. Typically we need brake/shifter housing and cables. 26″ and 700c innter tubes, brake pads, cleaning solutions and lubricants. We’ll pretty much take anything you can offer. If you’d like to help out but you’re in a different state, we can also take monetary donations to our Paypal account. We’ll take that money, and use it to purchase the parts. Our paypal ID: info@bikecommuters.com.